Thomas L. Flynn | Attorneys | Brick Gentry, P.C. Tom Flynn is a shareholder whose practice emphasizes banking law, gaming law, bankruptcy law, real estate law, wills and estate planning, and corporate law. Mr. Flynn frequently speaks to select audiences including bankers, attorneys, and regulatory officials. 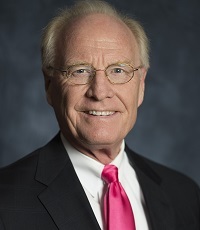 Flynn is a Fellow in the American College of Bankruptcy, and served as a bankruptcy trustee for over forty years. Listed in Super Lawyers of America: 2007, 2009 - 2014. AV® Preeminent™ 5.0 out of 5 Peer Review Rating by Martindale-Hubbell. Author, "Iowa Commercial Lending Law," appearing in "Commercial Lending Law: A State by State Guide," published by the American Bar Association Commercial Finance Committee. Revision co-authored with Brick Gentry Shareholder Erin Clanton, "Commercial Lending Law: A Jurisdiction-by-Jurisdiction Guide to U.S. and Canadian Law," 2016. Author, "Iowa Law of Guaranties, appearing in "Law of Guaranties: A State by State Guide," published by the American Bar Association Commercial Finance Committee. Author, "A Banker's Guide to Changes in the Bankruptcy Law," published by the Iowa Bankers Association in its October 2005 Disclosure. Author, "Chapter 12, Its Impact on Lenders," published by the American Bankers Association. Drake University, J.D., with honors, 1972 (Drake Law Review, 1971-1972). Morningside College, B.A. with honors, 1968. Served on the Board of Directors for a number of community entities including the Civic Center of Greater Des Moines; Variety - the Children's Charity; Des Moines Urban Ministries; Des Moines Public Library, and Meredith Drive Reformed Church.